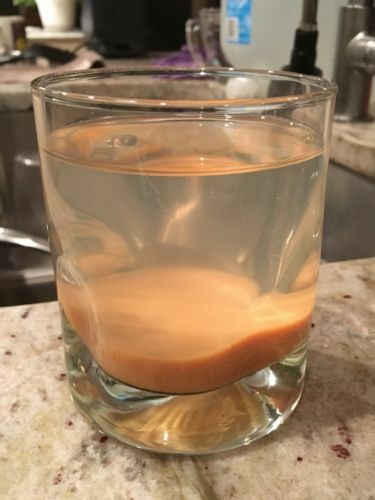 Here’s what our water looked like at 7:00PM last night. Not coincidentally, I’m sure, it’s the color of the soil around here. That’s considerably worse than than it’s ever looked. Here’s what that same glass looked like at 10:00PM. This entry was posted in Project: House on March 17, 2017 by cleek. 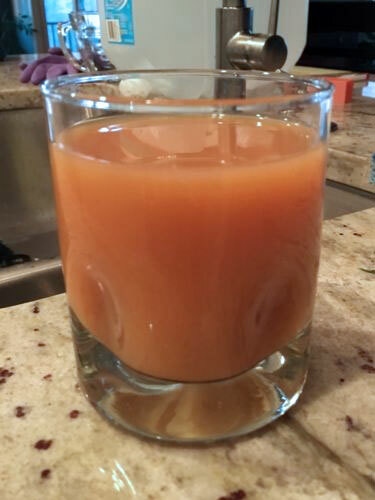 Just think of it as pumpkin juice & vodka. Or whatever you would mix with pumpkin juice. your well water is undrinkable, but at least you’re not barefoot and starving and crouched under a bush in Ithilien with orcs, oliphants, and Southrons all about, and Rangers hunting you. Do you have a 5 micron filter? More importantly, do you have a UV light downstream of that filter? How deep is that damn well? Something is seriously wrong. we have one of those standard string filters in the canister, now. i’ve tried a 10micron (i think) and it clogged up immediately. well is 450, 500. pump is at 300ft. yes, indeed, something is seriously wrong.